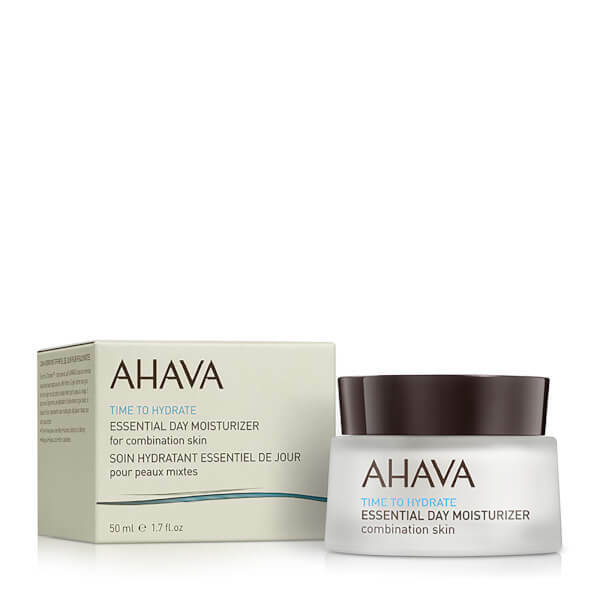 Delivering deep and long-lasting hydration, the AHAVA Essential Day Moisturiser has been developed with a cream-gel texture that melts easily into combination skin. Powered by Dead Sea Water that contains 21 skin-friendly minerals (including Magnesium, Calcium and Potassium), the lightweight, quick-absorbing formula works to restore softness and suppleness, without greasy residue. A blend of Pro-Vitamin B5 and Aloe Vera promote a smooth, healthy-looking complexion with renewed radiance and improved texture. Ideal for combination skin types. After cleansing, apply a small amount evenly all over face and neck. Aqua (Mineral Spring Water), Hexyl Laurate, Cyclomethicone, Aluminum Starch Octenylsuccinate, Propanediol (Corn Derived Glycol), Behentrimonium Methosulfate, Cetearyl Alcohol, Aloe Barbadensis Leaf Juice, Hamamelis Virginiana (Witch Hazel) Water, Phenoxyethanol, Glyceryl Stearate, Glycerin, PEG-100 Stearate, Urea, Saccharide Hydrolysate, Ethylhexylglycerin, Alanine, Glycine, Magnesium Aspartate, Creatine, Caprylyl Glycol, 1,2 Hexanediol, Maris Aqua (Dead Sea Water), Panthenol (Pro Vitamin B5), Menthyl Lactate, Parfum (Fragrance), Allantoin, Bisabolol, Disodium Lauriminodipropionate Tocopheryl Phosphates, Lecithin, Ascorbyl Palmitate, Beta-Sitosterol, Hydrogenated Vegetable Glycerides Citrate, Propylene Glycol, Squalene (Phytosqualene), Tocopherol (Vitamin E), Butylphenyl Methylpropional, Linalool, Hydroxyisohexyl 3-Cyclohexene Carboxaldehyde, Hexyl Cinnamal, Limonene, Citronellol, Geraniol.